NASA's TESS spacecraft is enclosed at the top of SpaceX's Falcon 9 rocket, set to launch April 18 at 6:51 p.m. EDT (2251 GMT) after a two-day delay. After a delay, SpaceX is winding up again to launch NASA's Transiting Exoplanet Survey Satellite (TESS) today (April 18) from Cape Canaveral Air Force Station in Florida. The 30-second launch window of SpaceX's Falcon 9 rocket is set for 6:51 p.m. EDT (2251 GMT), and you can watch the launch live on Space.com's home page starting at 6:30 p.m. EDT (2230 GMT), courtesy of NASA TV. After launch, the rocket's first stage is set to attempt a landing on the SpaceX drone ship Of Course I Still Love You. After it reaches space, TESS will maneuver into an oblong orbit around Earth, circling twice for each orbit of the moon. From there, it will search for a telltale darkening of stars as planets pass in front of them. It will use this technique to identify exoplanets relatively near to Earth that could be investigated by future telescopes, such as the James Webb. It will build on the work of the Kepler space telescope, which found exoplanets in a similar way but circled the sun, rather than Earth, and focused on one small patch of the sky for its first mission. Kepler has identified 2,650 exoplanets to date, which is more than 70 percent of all known, alien worlds. The TESS launch was called off April 16 to allow scientists to conduct more guidance navigation and control analysis of the rocket, NASA officials wrote on Twitter. "The @NASA_TESS spacecraft is in excellent health and remains ready for launch on the new targeted date of Wednesday, April 18," they added. 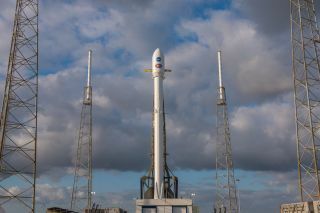 NASA's Kennedy Space Center also confirmed on Twitter that the launch would proceed April 18, and SpaceX posted that everything was looking good this morning. Weather is looking good for today's launch, with the Air Force's 45th Space Wing weather squadron forecasting that conditions will be more than 90 percent favorable for the launch.